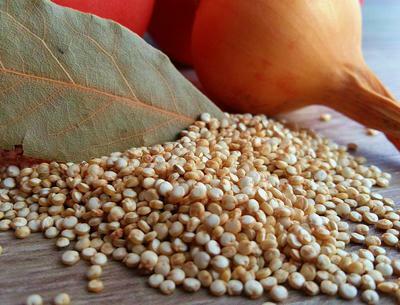 Quinoa has been enjoyed in its home, South America, for over 3000 years. 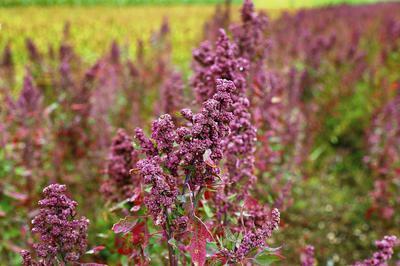 It is still grown mainly in Bolivia, Peru and Ecuador although farmers in the southern states of the USA are now growing quinoa as it becomes more and more popular. In the UK it is now available in some of the major supermarkets as well as the larger health food stores. Quinoa is often called a grain and is usually catalogued in the grain section of shops. It is actually a seed from a plant that is related to Spinach and Chard. You can eat the leaves as well as the seeds. Of course the leaf version is only available where it is grown as it does not store or travel well. The seed version however is increasing in production and is recognised by nutritionists as one of the most beneficial foods in terms of mineral and vitamin content. The Quinoa seeds are little oval seeds 2 - 3 mm in size. They are usually creamy yellow although red and black varieties are available in some countries. They come in dry packs of 500g or 1kg ready for you to cook. You can use them as a replacement for rice or cous cous. Having said this it does have its own flavour and characteristics that make it quite versatile in the kitchen. The most basic method of cooking quinoa is to boil it in water and simmer for 10 -12 minutes. You need 1 measure of quinoa to 2 measures of water. All the water will be absorbed by the Quinoa. Some quinoa still has a coating of bitter tasting saponins. In this case you need to pre-rinse the quinoa to remove this coating before cooking. You are unlikely to buy coated quinoa as most shops sell it pre-rinsed but its best to be sure. Once you have cooked the quinoa you can add it as a base for meat dishes instead of rice. You can also include it salads and soups. It takes on the flavour of the foods you cook it with and adds it own little bite to the taste. When the quinoa is cooked you get a little "tail" that is the germ of the seed. This has a very pleasant crunch to it when you eat it. This is why I think people say it tastes a bit nutty. I'm not sure I agree but quinoa does taste good. You can microwave quinoa and put it in casseroles as a thickening agent. You can also find quinoa flour and quinoa flakes that you can bake with. The flour is not like wheat flour and you need to use your ingenuity to use it properly. What is Special About Quinoa? There are a number of things that make quinoa special. Firstly it is gluten free so for people who need to avoid gluten it is a great addition to their diet. It also has all the essential proteins so is good for supply vegetarians with minerals and vitamins you can't get easily from other foods. Finally it releases its carbohydrates into the body very slowly so helps people with diabetes, Irritable Bowel Syndrome and other dietary related diseases. About the Author: See more at www.quinoatips.com.